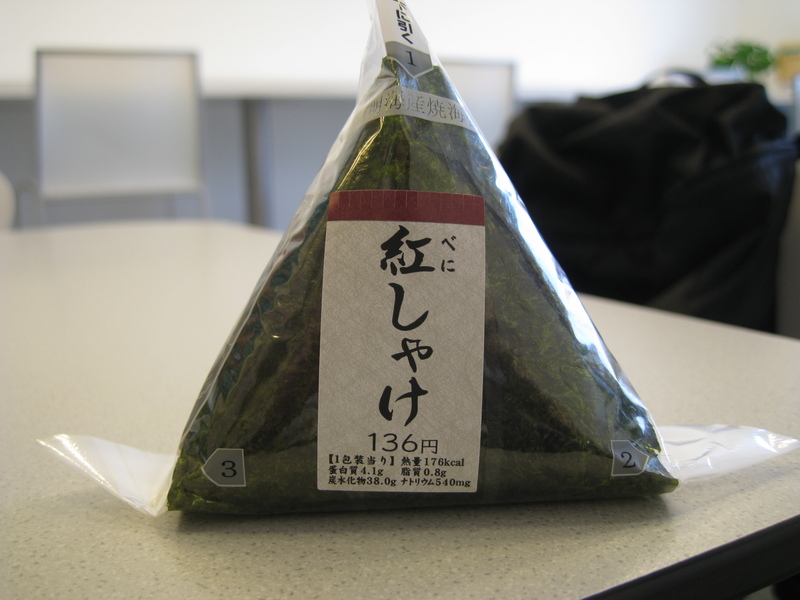 The Rice Ball- The national snack of Japan. Sold by the dozens in every convenience store in Japan, each costs about 120 yen- 140 or $1.20- $1.40. Crunchy sea weed surrounds sticky rice which then encapsulates a filling. 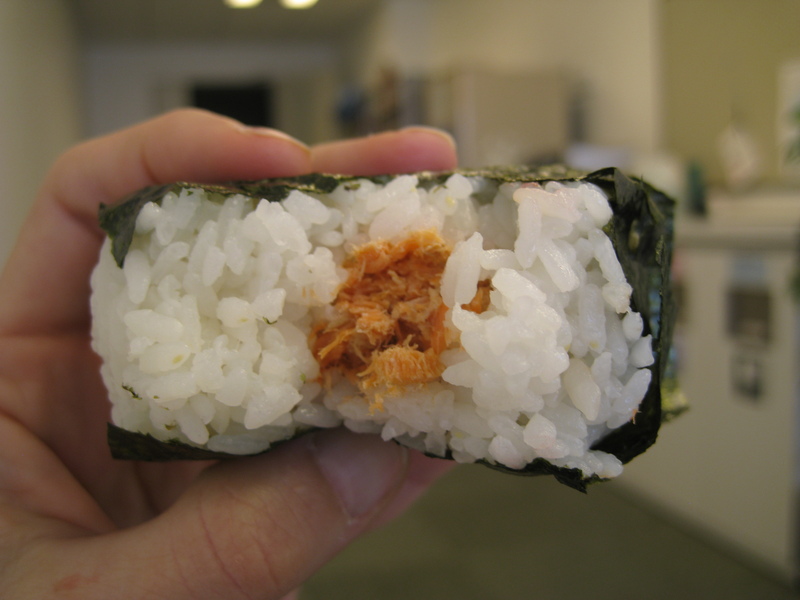 The filling could be salmon, salmon roe, Japanese plum, pickles, Korean barbeque – or anything the maker has close by. 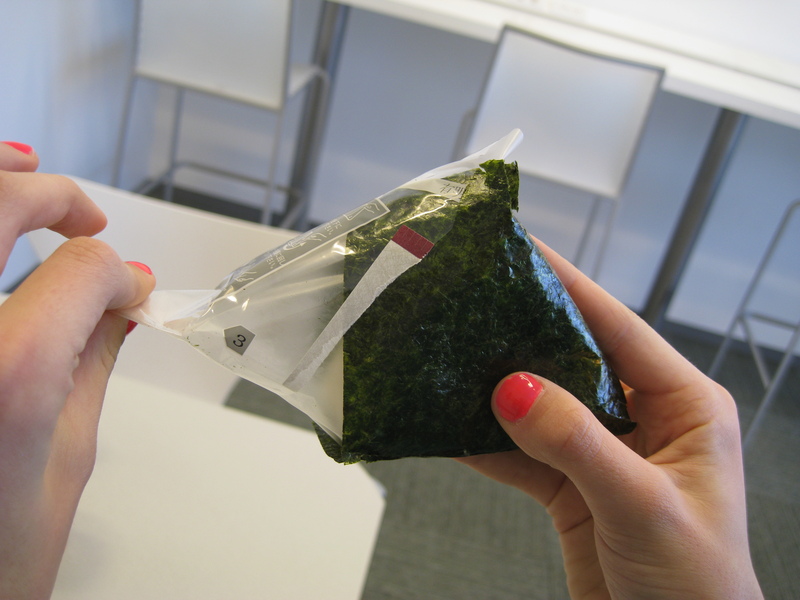 For me, there are two mysteries to this snack, the first is the filling since I can’t read and the second is how to unwrap the rice ball without tearing the sea weed. In the beginning, I loved the mystery that was the “reveal.” What did I get? Until I got salmon roe. 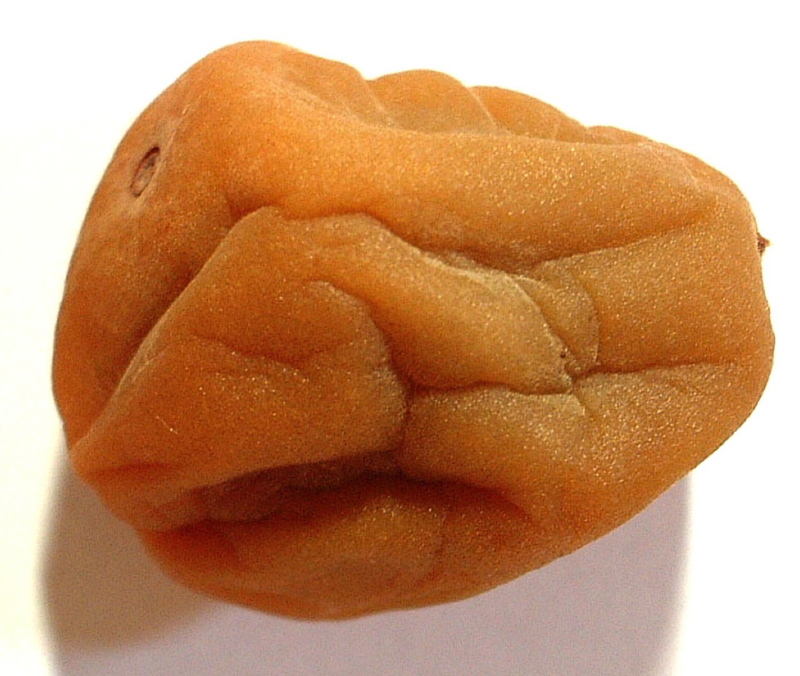 Then the moment became more of a relief, “Thank God I didn’t get the salmon roe.” Realization dawned that my favorite- pickles- were only 100 yen which cut my chances of salmon roe down to zero but upped my odds of something else hard to swallow- Japanese plum or Umeboshi. Not dried or sweet but runny, salty and akin to emptying a mouthful of a sugar substitute like “Sweet and Low” in one’s mouth all at once. This flavor is a particular Japanese favorite and a classic example of an Eastern staple difficult for Westerners to stomach. I’ve now memorized the characters for “pickle” so the revelry in my game playing is somewhat diminished. Part II of the game remains. 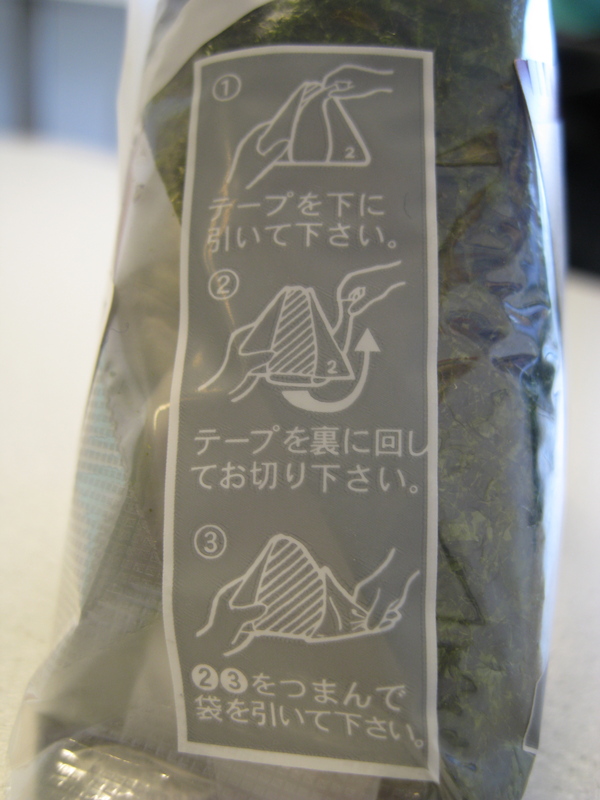 How to open the Rice Ball? What’s so hard about it? It’s just wrapped in paper say you. 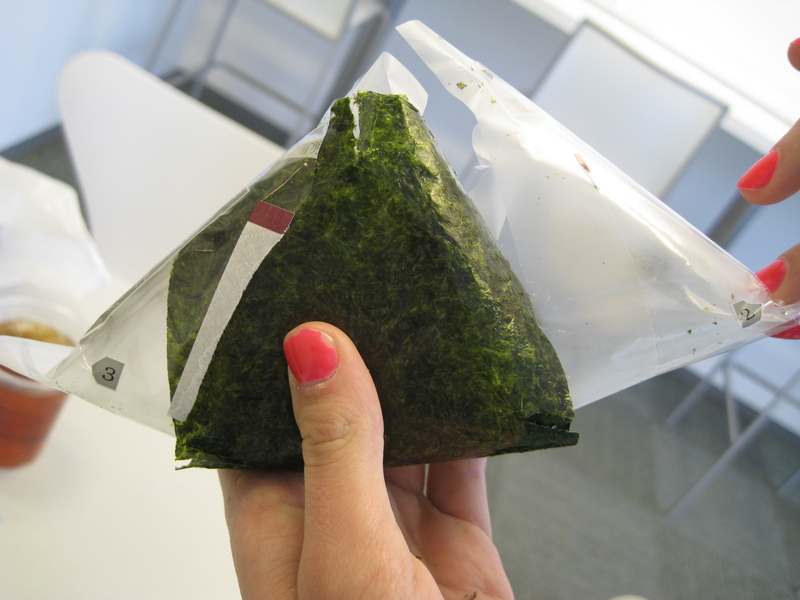 Well, in order for the sea weed to remain crisp, it must remain separated from the rice, therefore, there is paper between the rice and the sea weed. 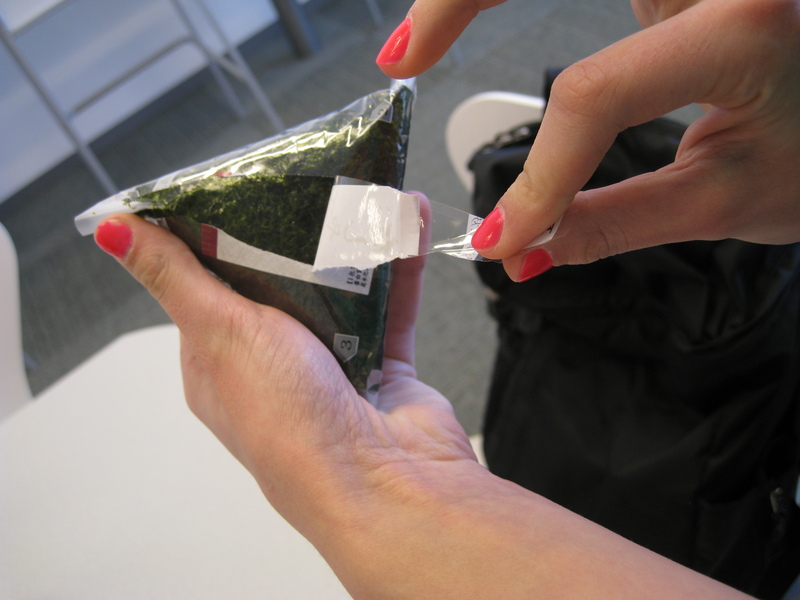 When opening the rice ball, one must pull off two layers of paper – the paper surrounding the entire rice ball and the one between the rice and the sea weed – without pulling off the sea weed in the process. A rudimentary analogy would be the pulling off the tablecloth on a fully set table without upsetting the silverware and the plates. In order to demonstrate this process, I needed an able-bodied assistant capable of actually performing this amazing feat. Offspring #2 not only was capable, she had her nails done. Step #1, Read the directions- if you’re able to decipher. Which I’m not. Step #3- Here’s the part where I start to get confused. Locate the number and pull. Offspring #2 has this down pat. I usually pull the wrong parts. Even though I’m at Number 1, where exactly do you grab? At this point, I usually rip the sea weed in half. Step #4- Keep going even though you’re scared….all the way to the back side. Step #5- Now time for Step #2- Very gently- start to pull… The last two steps pull the layers out from under the sea weed. VERY gently…. this is where it all goes to HELL fast…. Some species of fish- tastes good. 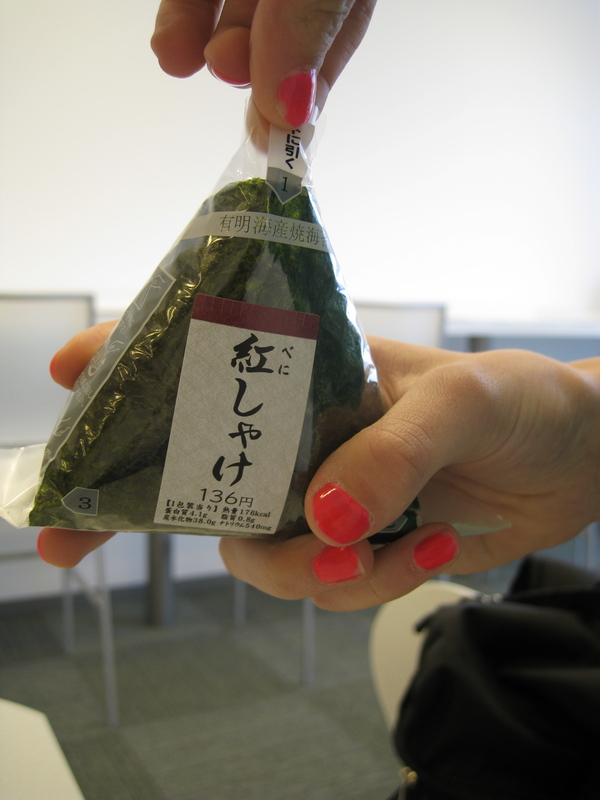 This entry was posted in Moving Lesson and tagged Amblerangel, Culture, Emily Cannell, food, Humor, Japan, Japanese Pickle, Moving, Rice Ball, Snack, Tokyo, Travel. Bookmark the permalink. I miss rice balls. I really do. Oh God… I think I need to make some rice balls tomorrow. I fill mine with Tuna, but I think I’ll have to give a Salmon filling a go. Wow… now I’m really hungry. Thanks you- yes! 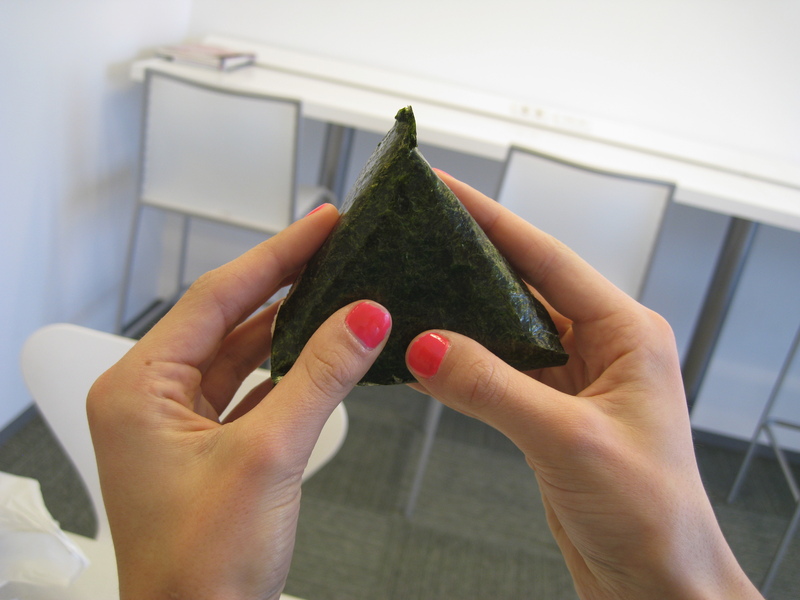 ONIGIRI! How could I have been so LAME as to have forgotten to mention the NAME? I can’t stand the name rice balls – it is so non-expressive! There is simply no translation…like so many Yiddish words, you just have to add the Japanese to your vocabulary! They grow on you…All the sudden you just want that perfect mix of sea weed with rice mixed and a little somethin’ else….. I come from a place where the staple food is rice…but I have never heard of rice balls. Though we do have several rice dishes as snacks, the rice never actually resembles the real rice as in the rice ball as it is usually crushed and smashed within an inch of its life.. Oh dear…I wonder if that sentence made any sense to you. Actually it did. Until I moved here, I never thought of rice as a snack food. Sure is good. the root of all evil as some of us have been led to believe! This was fun to read and I’d love to try one someday. But isn’t it a triangle and not a ball? Most of the time they are sold as a triangle however they are also made in oval shapes- rarely. I guess that’s why they’re referred to as rice balls. Yum that looks delicious, I love Japanese food so much I am thinking of buying a cookbook and eating lots of it that I can make at home. 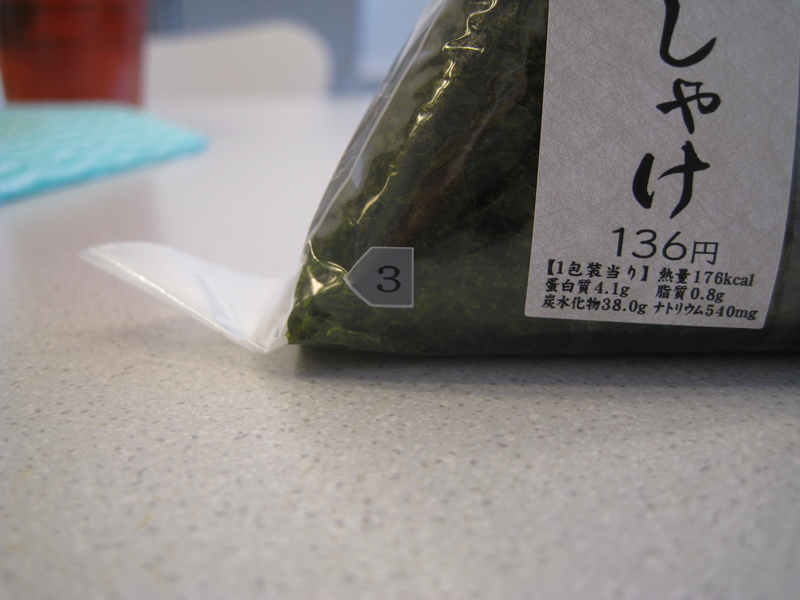 There’s Japanese shops here in London where you can buy ingredients. Let your inner Japanese foodie OUT!!! I lived in Southeast Asia for nearly a year and never ate a rice ball–though I never noticed them in Vietnam. Are they particular to Japan? Don’t know that I could stomach the filling. It all sounds semi-disgusting to me. Bravo to you, intrepid eater that you are! Thank you! We’re hoping to visit Taiwan! I’ve heard it’s beautiful. Wow, a snack that comes with instructions! And probably not enough calories to truly be classified as a snack . . . it’s more like a morsel of regular food. You’re exactly right! The Nose said it looked like cat food. The only image I see in this post is popping open a can of cat food- the look and likely the smell. I can’t wait to try them, maybe one stuffed with the delicious shrimp eyeballs referred to earlier! I thought I was the only person who couldn’t open one of these properly. 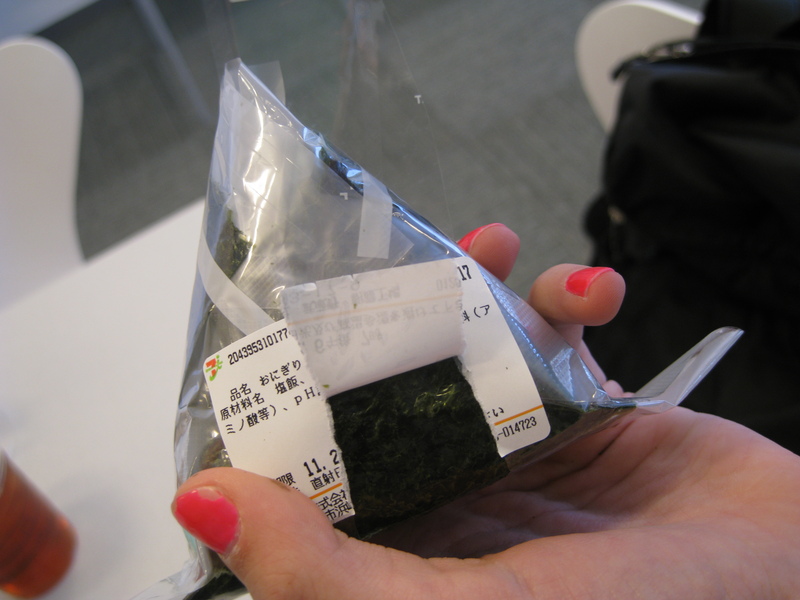 First time I tried, parts of the seaweed was stuck inbetween the cellophane. Then as I ate, bits of rice detached themselves and fell all over the table. It is an art form I think! I agree! So easy to make- so good! I wish I could figure out which is which at the combini though…. I also like tempura so much more here than in the US! Less greasy and more crunchy… Thanks for stopping by! The Japanese on the front describes the kind of fish! Salmon.